Mailart 365 – what is it? Mailart is a term which describes a piece of artwork made with the intention of sending it somewhere in the post. 365 is the number of days in a year. 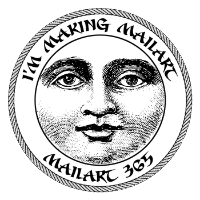 Mailart 365 is a year-long project starting on December 1st, 2010, to make and send a piece of art in the post every day for a year. Artists attempt to make and send 365 pieces in the post, to whoever they please and while doing so, they’re posting up their efforts right here on Mailart 365. Since the start of the project over 10,000 pieces of mailart have been made and sent out and new pieces are being made every day.